An arts conference at a church in Texas for 'artists, geeks and storytellers' has been shown the first footage of Darren Aronofsky's big screen biblical epic Noah, starring Russell Crowe, reports the Hollywood Reporter. The film, which also stars Anthony Hopkins as Methusaleh, Jennifer Connelly as Naameh, Emma Watson as Ila and Ray Winstone as Tubal-Cain, is due to reach cinemas in March 2014. Aronofsky told the conference audience "Noah's very much been a patron saint in my life leading me toward my creative endeavours." He hoped to keep the screenplay faithful to the words of the Old Testament story. 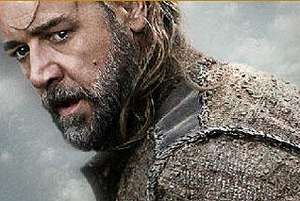 "I'm excited that Hollywood has finally agreed to make the first biblical epic in almost 50 years," he continued. "It's been a long time since Bible movies were on the screen and there's been a lot of advancements in technology and special effects, and maybe that's the reason why Noah's never been attempted on the big screen before, because of the size and scale of the deluge and all the different animals … but now, finally, with Hollywood's help, we can actually do this and bring it to life." Mel Gibson's The Passion of the Christ took some £397m at the box office in 2004.